In each of our homes, Ryan and my favorite spot in the house during California’s colder months has always been the fireplace. When designing our home, we knew we wanted to make our fireplace both a statement piece and a cozy spot for family and friends to gather around. I was fortunate enough to be able to document every step of how we created our dream fireplace. The pictures below will take you from Day 1, through Demo, the specific steps of how-to, and finally our finished look. The mold is carefully removed and the concrete is left alone to dry. Colored smooth stucco was added on top of the concrete to give it that clean modern look. We then finished off the smooth stucco with a sealant that will protect it from any future staining. For the time being, we gave the inside of the firebox a fresh coat of paint. In the near future we will cover the firebox with herringbone black bricks. We couldn’t be happier with our finished fireplace. We love that the space turned out clean and modern yet inviting with the seat cushions and pillows softening the look. If you have any questions about the process or materials used, don’t hesitate to email us your questions! Well, we are officially moved in and I did a terrible job keeping up with updating you all but I’m going to make it up to you with endless content now - I promise. Before I go into specific topics, here is a little bit of insight behind our selections. My inspiration for our finishings is modern minimalist softened with a touch of warm beach tones and textures. I used a lot of grays and whites throughout the home giving it that fresh modern look. My intent was to keep that clean, crisp feeling throughout the home, but also wanted to be sure that it didn’t feel too cold or sterile - this is where the warm beach tones and textures came in. We chose warmer wood floors with natural black knots washed with a very subtle white undertone. We also warmed up the home by adding white oak wood accents throughout the kitchen and family room and gave the bathrooms a touch of color and depth by using quarter sawn Walnut for the vanities. We hope you enjoy seeing our personal touches as much as we have enjoyed making our vision come to life. We can’t wait to host and welcome all family, friends, and those of you who just need a little bit of inspiration for your own project. I am going to start off in the showers. Keep in mind that these are my iPhone pictures so colors may look a bit off and photos may appear dark. Good news is that we will soon have professional photos that will more accurately picture all the details. 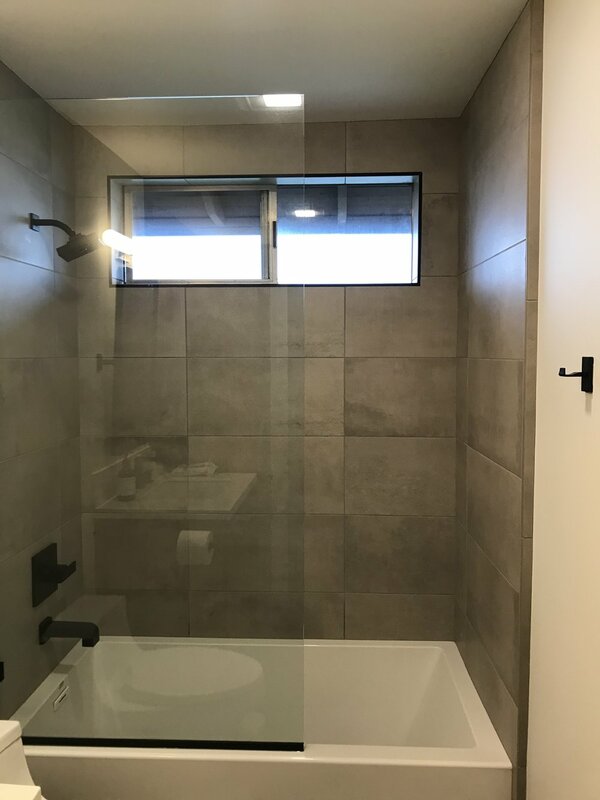 12” X 24” tiles were used on the floor and up the shower wall. To keep the simple look, we placed a single pane of glass on top of the square style tub. A flat black Schluter was installed along the window line to finish off the edges. Again, we chose matte black for all fixtures and hardware for the contrast of dark against light. The shower walls are covered in Italian tiles laid in a herringbone pattern and is enclosed with a floor to ceiling single pane of glass. The floors are finished with grey 12” x 24” tiles which also continue into the floor of the walk-in shower. Also pictured is the vertical infinity drain. Shower niche - edges are finished off with black Schluter. 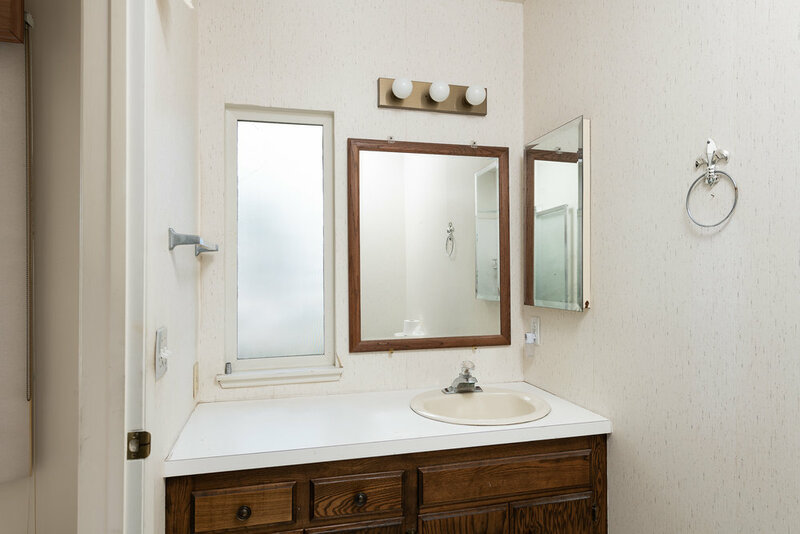 Stay tuned for the bathroom vanity details next! The last time you saw our house it was completely gutted! Now that the drywall is up and texture is complete, we are slowly seeing our vision come to life. During this phase we had all new electrical put in, re-plumbed the entire house, removed old insulation and replaced with new insulation, and put in new drywall throughout. To re-plumb the house, we had to break up the concrete in several places like you will see in the pictures below. We also decided to break up the concrete in the master shower so that we could create a true walk in shower with no curb. By creating a slant in the tile, the water will be directed to the drain rather than running onto the bathroom floor. We are excited to see how it turns out! Now that the foundation is set, the project will begin to move fairly quickly. Since the drywall is up and the texture is complete, it is time to start priming the walls and prepping them for paint. After the concrete trenches are filled in, tile flooring can be installed in the bathrooms. The wood flooring and kitchen cabinets will have to wait at least one week before installation so that the concrete has time to dry out. While releases moisture while drying, therefore nothing with wood can be installed on top until the concrete is fully dry. 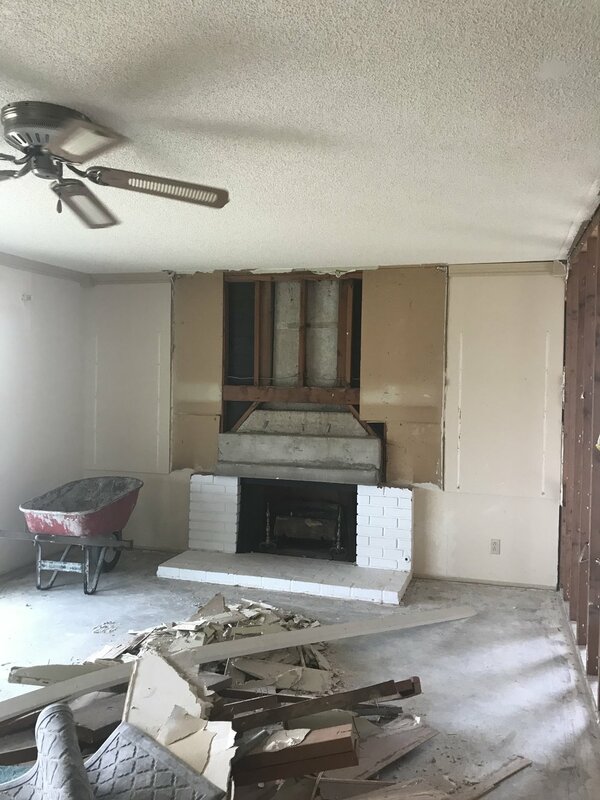 We definitely learned a lot during this stage of our remodel. It has been the most frustrating phase so far and we have had to have a lot of patience. Working on the guts of your home is expensive and at times very unpredictable (especially on an original 1965 home! ), but the fun aspects of the remodel are starting! Appliance shopping is one of those chores that you really don’t want to do, but you know you need to do. At least this is how Ryan and I have felt about it. So, with that in mind we decided to make the most of it and really dive into appliance brands, what the brands stand behind, and find our appliance expert to lead the way. We shopped at both the San Juan Capistrano location and the Irvine location. The Irvine showroom has been recently remodeled and has much more to see than the San Juan location. We had an equal service experience at both locations, none of the showroom specialists struck us as very knowledgeable about the different brands. We decided to make the drive down to Vista and are SO glad we did. We were greeted by Matt who quickly learned what we were looking for and began to give us his professional opinion on what appliances would get us the biggest bang for our buck. Our goal for our new home is to finish it with middle grade finishings. We did not want to go cheap and we did not want to go all out on the luxury finishings. With that said we were running into the constant dilemma of whether to go with a Freestanding Fridge or Built-in fridge. Here is an illustration of a free-standing fridge. This paints the perfect picture of all the negatives and positives. You can purchase a middle grade free-standing fridge for around $2k vs. the price for a middle grade built in is minimum $8k. Our dilemma was this- we couldn’t imagine purchasing a free-standing fridge when we are having beautiful custom cabinets made for our kitchen. Frankly, it’s also really hard to look at free-standing fridges after you started looking at the built-in’s. The built-in’s just have a luxurious, clean look about them that you can’t say ‘no’ to. This is the 36” built-in with French doors. With this fridge you have the option of wrapping it in the same wood as your custom cabinets-we opted in to do this. They also have an extension of the top panel that will allow the wood to be all one seamless piece without that separation of the top panel. This ultimately will create a clean look, another plus is the cabinet hardware will match the fridge hardware. Find an appliance expert- we highly recommend Matt Kleist at Ferguson in Vista. He is extremely knowledgeable about all appliances, is professional, not pushy, and gets back to you quickly on all questions. Well, we have officially opened up our home and have begun the reframing process. After visiting our home in its current condition, we find ourselves asking each other "WHAT HAVE WE DONE?!?!" I'm kidding - in all seriousness we feel blessed to have the opportunity to undertake this project. Our goal is to take away as much knowledge as possible to pass on to our clients, friends, and family so that we are able to advise on ALL areas of real estate. 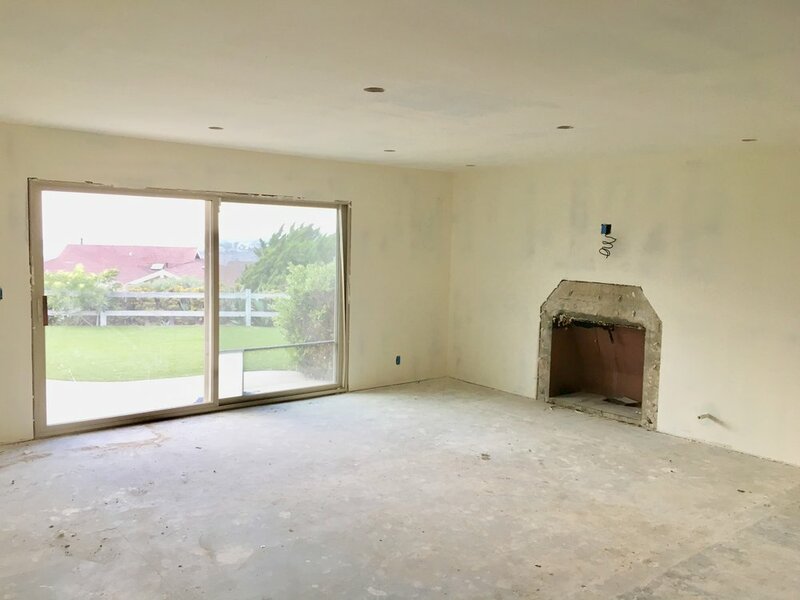 You are probably wondering what we have planned, so to paint a clear picture, we are going to give you a BEFORE picture followed up with a CURRENT picture describing what we have done and a brief summary of what our end goal is. We decided the best use of this space is to create a large walk-in pantry. We will wall in the windows and have our finish carpenter build in shelves for a usable open pantry space. The entire bathroom was demoed. The doorway was opened up and re-framed and we removed the linen closet to open up the space. To replace the old linen closet that opened into the hallway, we will be installing custom floor to ceiling shelves that will remain in line with the new vanity. A new vanity, new toilet, and shower with tub will be installed. 1. Opened up the hallway to make it wider. Apparently it was a thing back in the 1960s to have a fun sized hallway! 2. Removed the wall dividing the master bedroom and second bedroom to turn it into a master suite. This photo is looking directly down the hallway into the opened up master bedroom. Master bedroom is now opened up with all new framing. We will be creating a large walk-in closet that will take up a significant portion of what used to be the second bedroom. DON'T MISS OUT ON THE NEWEST UPDATES - SUBSCRIBE TO OUR BLOG! We are thrilled to have you join us on our remodel journey! If you would like to stay updated on the latest happenings, please subscribe to our blog on the home page.